Every year I fall more and more in love with vintage inspired Halloween decorations. 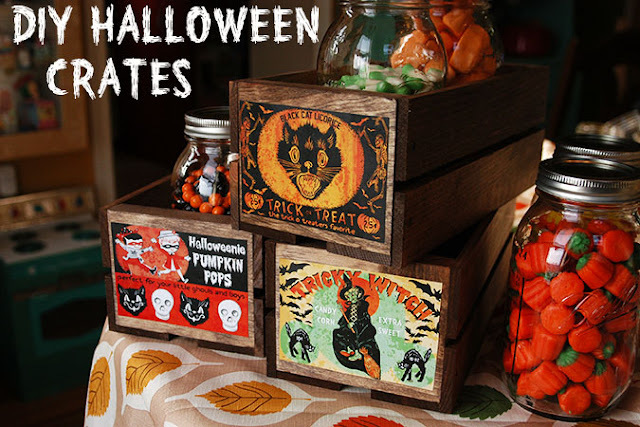 These DIY Halloween Crates that Heidi made are no exception. I sort of NEED them!! Not only was she nice enough to share a tutorial for these DIY crates, but she even shares the printable labels she used to make them. No need to go out and hunt down vintage looking Halloween scrapbook paper!! You can get the printable vintage Halloween labels and see how to make your own Halloween crates over at My Paper Crane.